The other day my husband and I went to the only store in town within thirty miles; it’s a monstrosity called Fred Meyer’s, or, “Freddy’s” by the locals. It’s about the size of Costco and it sells everything like CC only not in bulk. In short, I dislike Fred Meyer’s very much. For twenty years I’ve procured my staples from little mom & pop stores – like Encinal Market and our vegetables from Paul’s produce stand, so the transition has been a little difficult. Unfortunately, Freddy’s is the closest grocery store to our little house by the sea, and there are no specialty markets in town. Still the pluses outweigh the minuses. We’ve replaced the hustle and bustle of city life for peace and quite, the air here is the cleanest I’ve ever breathed, and we’re surrounded by nature. It’s just what we need at this time in our lives. Luckily, we have a tiny farmer’s market at the Chetco Grange Hall, which has been hopping since 1934. It’s open May thru December, so during the months the farmers are “resting” I sometimes make the 2-hour drive to Eureka and shop at the North Coast Co-Op…but I digress. Simply put, whenever I go to Fred Meyer’s I wear my shades. It’s not because I think I’m too cool for school or I’m too lazy to take them off. It’s the lights, they’re incredibly bright, and I just think everything looks more attractive in the amber hue of my Ray Ban’s. Plus, the majority of the people living in this town are 60+, which I love, but this demographic gives Freddy’s the incentive to raise their in-store temperature to 70 degrees it seems. The very warmness of the place makes me feel it is rather appropriate to continue wearing my shades. I still grin and greet people as I shop, and I’ve even encountered a few older women wearing vintage sunglasses – little rhinestones dangling from the sides, which I always smile at admiringly. So where’s the harm in wearing my shades at Freddy’s? According to my husband it’s rude, and to talk to someone with sunglasses on your face is abominable. Of course I love the fact that this drives him crazy so I tend to “forget” to remove them whenever we’re shopping together. He never tells me to take them off, in fact, I think he enjoys the thought that he has superior etiquette in this instance, which makes me adore him all the more. Having worked for Macy’s in San Francisco and The Limited in Oakland when I was younger, I never cared if people wore their sunglasses while shopping. 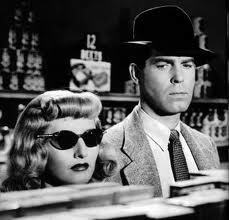 In fact, I thought it was rather glamorous and mysterious whenever I spied a woman shopping with her shades on. Perhaps I was unique in this outlook.